“Experience is a major factor,” he said. “We have very few guys that have gone far into the playoffs. 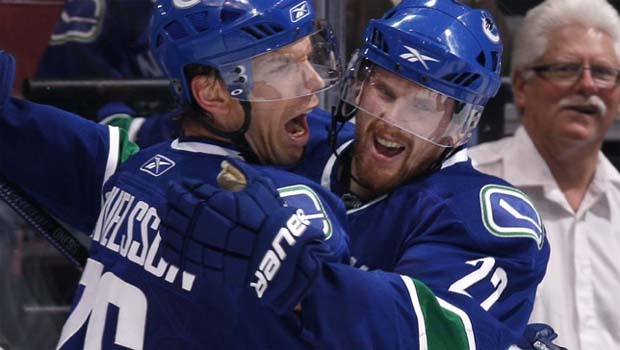 This summer, Gillis retooled the Canucks’ roster. He upgraded the bottom-six and rebuilt the defense. But did he add the leadership and experience he wanted to? J.J.: Of the four key additions to the Canucks’ roster, only two have gone deep into the playoffs: Manny Malhotra went to the Conference Finals with the San Jose Sharks last season, and Raffi Torres went to the Stanley Cup Finals with the Edmonton Oilers in 2006. The two key additions on defense, Dan Hamhuis and Keith Ballard don’t have significant playoff experience; Hamhuis has never played past the first round, while Ballard has yet to suit up in the postseason. That said, most of the core has been together for a few years now and they’ve made the second round of the playoffs three of the last four seasons. Lack of leadership and playoff experience should no longer be an issue with this team. As a group, they’ve played enough playoff games now; I just hope that they’ve been able to learn from their losses. Chris: Has MG brought in veteran leadership? Not sure. Ballard is a decent addition on the blueline, but that’s tempered by the loss of Mitchell. Hamhuis is definitely no rookie, but even in his five seasons in the NHL he still lacks the experience the wily vets usually have (let alone the playoff experience). You can add Malhotra and Torres to the conversation, but I’m not sold that Torres has figured out his own game well enough to provide leadership. All in all, we haven’t really seen much of a net increase. Katie: With Malhotra I think he did a good job in terms of adding veteran leadership and playoff experience. In fact, I wouldn’t complain if Manny was given an ‘A’ to start the season. Torres also has some playoff experience with the Oilers. Richard: Mike Gillis didn’t bring in a lot of playoff experience, but I think the team and its core already have enough collective experience. Samuelsson is the only one that has won a Stanley Cup, and I thought he did a good job of providing leadership in last year’s playoffs. Manny Malhotra is a great addition – he’ll mentor the prospects and assist the veterans. Cam from Canucks Army: Uh, not exactly. There are a grand total of TWO Stanley Cup rings in the dressing room so that speaks for itself. However, the addition of Malhotra does add more veteran leadership. That said, I think both of those things are a bit overrated. Kesler, Henrik, Daniel, Luongo and Hamhuis have plenty of leadership so adding shouldnt have been a huge priority. As for playoff experience, the group in the room already knows what it takes to win in the playoffs. They have to battle their own demons of previous playoff failures and overcome them. To me that would be as strong a motivator as you could possibly have. Mike from Nucks Misconduct: He did add a couple pieces, but I don’t think it is truly going to matter. Samuelsson is still the standard bearer in terms of playoff experience; the new guys don’t eclipse his 81 playoff appearances and 50 playoff points. Malhotra has two goals in 24 games, Hamhuis has nine points in 28 games, Torres has 15 points in 30 games and Ballard (thanks to being trapped in Florida) has none. But I do think these guys bring qualities to the team that weren’t there before. Malhotra has been lauded for his strong work ethic from Columbus and San Jose, so hopefully that catches on with others and the same can be said of Torres (in Columbus not to mention his Cup run with Edmonton in 2006). Nashville runs a tight ship and hopefully Hamhuis will infuse part of that system into the backend. Next story Canucks Season Preview Series: Can Coach Coach?